Media literacy is defined as a compilation of technical, cognitive, social, civic and creative capacities that allow a citizen to access media in all formats, have a critical understanding, and interact with it. In an increasingly digitalised society where media is going online, digital literacy is also key. At the same time, people often lack the necessary skills to use the vast variety of digital tools available to them and to critically examine information. Improved media and digital literacy among the population means more media alternatives and strengthened agency to participate in the public sphere. This importance of media and digital literacy is widely recognised. It is often cited as a solution to growing contemporary challenges such as disinformation, fake news, online hate speech, cyberbullying and online safety. Yet oddly, this rarely results in concrete policies or resources to increase the media literacy of the public. Media literacy is often discussed at debates on fake news, platform regulation, journalism standards or data exploitation but these debates are rarely attended by educators, teachers and pedagogues. At European level, a recent policy initiative of the European Commission, the Digital Education Action Plan, mentions media literacy in the context of cybersecurity and online safety. Will this lead to creating a media literacy support framework at policy level? Will this be the first step towards going beyond debates and acknowledgement, and acting upon it? 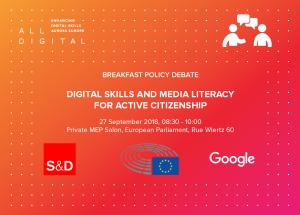 This debate is co-organised by Emilian Pavel, Member of the Employment and Social Affairs Committee in the European Parliament, and ALL DIGITAL, a pan-European network of digital competence centres. ALL DIGITAL, established in 2007, is a major European Association in the field of digital inclusion and empowerment united by one purpose: empower Europe through digital skills. Our vision is that every European should be able to exploit the opportunities created by digital transformation. Our members are low threshold community centres, NGOs, libraries, other public places where people can access technology and the Internet and learn digital skills. During this breakfast debate we will discuss the role of different stakeholders in supporting all citizens to develop media and digital literacy. 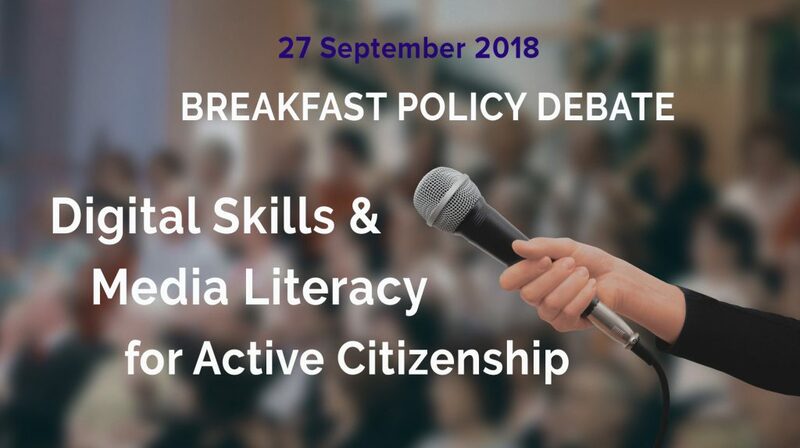 We will hear from key experts and stakeholders about what policy, as well as joint efforts, are required in order to foster media literacy and take this important issue beyond debates and wishful thinking.